The author of this thought provoking addition to Gower's Transformation and Innovation Series has worked as a management consultant in the Arab Middle East for 25 years. 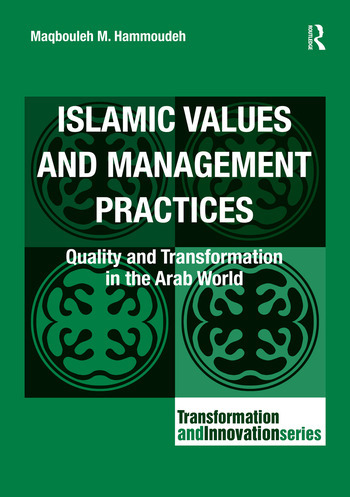 In Islamic Values and Management Practices she acknowledges that businesses and other organizations in the region face urgent concerns in relation to quality and transformation, but argues that these issues might be more appropriately addressed by the application of an Islamic Management Model, rather than the 'Western' one hitherto applied. Over time, a set of management systems based on Islamic values has been developed by the author. These systems recognise the need to build human organizations, socially and politically as well as commercially, and also the recognition that for Muslims, justice is the ultimate value, bringing balance between the individual's soul and spirit on the one hand, and the organization's soul and spirit on the other. This Islamic management model stresses that effectiveness is an outcome of operating efficiently and at the same time unifying the organization's objectives with those of its employees and wider society, and ensuring that at the strategic level the long view is always maintained. Recounting her own personal and business journey, Maqbouleh Hammoudeh presents the outcomes of research that has tested the application of the Islamic Management Model and its ability to deliver the desired quality and transformation outcomes in a major civic or profit making organization. At a time when many practitioners and business educators are seeking new management approaches, this revealing case study sheds light on the evolution of a contemporary theory of management for the Muslim World. Maqbouleh M. Hammoudeh is the General Manager at Team International Engineering and Management Consultants, Amman, Jordan, with 25 years experience as a consultant. Maqbouleh Hammoudeh has a Batchelor's Degree in Economics and Statistics from the University of Jordan and an MSc. in Transformation Management from the University of Buckingham in the UK, where she is currently participating in a doctoral programme. She is a Certified Management Consultant and holder of a Doctor-Act certificate and has undertaken assignments in organizational development and HR management for numerous public and private client organizations. She is a management trainer in many topics related to the top management leadership skills and quality systems, in addition to the human resources development.